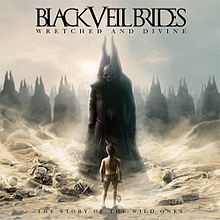 RockUnitedReviews: BLACK VEIL BRIDES: "Wretched And Divine: The Story Of The Wild Ones"
BLACK VEIL BRIDES: "Wretched And Divine: The Story Of The Wild Ones"
Black Veil Brides came to my attention in an old-fashioned style - via a music TV channel. We were in Germany, taking a break in the hotel room, and there was Viva or some other similar channel on TV. Among the usual pop/r'n'b/chart stuff the Brides' "Rebel Love Song" video stood out like a sore thumb. The song was a great, catchy hard rocker and the band looked like a updated version of Mötley Crüe. The album went to the shopping list immediately. Now the Brides have released their ambitious third album. "Wretched And Divine: The Story Of The Wild Ones" is a concept album about a group of rebels ("The Wild Ones") who are fighting an evil organization called "F.E.A.R.". In addition to the album, there's also a movie titled "Legion Of The Black", which is or was apparently available somewhere as a Pay-per-view movie. Watch out for a "deluxe edition" of the album with a DVD... or the other way around. Apart from those "subtle" songs, there are some big and bold singalong anthems: "We Don't Belong" relies on the tried and trusted "Whoa Whoa Ohhs", while has some of those too and a children's choir to boot... not to mention one of this year's biggest choruses. All in all, a fine album with an interesting storyline, yet the songs work as single pieces of music too. JIMI HENDRIX: "People, Hell and Angels"
EARLY MAMMAL: "Horror At Pleasure"
Chantal CLARET: "The One The Only"